I just had a service loaner Chevy 1500 LT for 4 days - a complete clone of my truck, down to the color. The steering felt significantly stiffer in the loaner vehicle. Is there any way to increase/decrease the stiffness of the power steering in this vehicle? I'd like it to be a bit stiffer - it feels a bit to easy to turn the wheel. My '15 Mustang and even my old '06 VW Jetta had a way to adjust this. The Mustang can be adjusted through the Driver steering wheel controls, and the old VW could be adjusted through a software change via the ODBII port. In stock at my local dealer (Henna) - 35.00. Easy enough. Thanks All! This is AWESOME - just was I was looking for. Thanks! New to this forum, but a 20+ year truck owner. I've had 2 Dodges, 1 Chevy, and 1 Ford. I just picked up my second (current) Chevy 5 days ago. 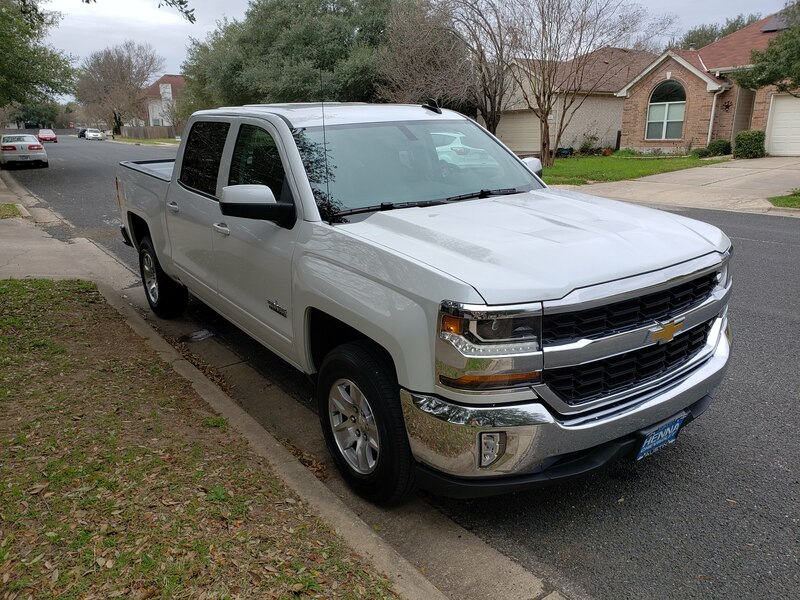 It's a former dealer courtesy truck - 1500 SLT Texas Edition with 3000 miles on it. Coming from my trade-in, a Dodge 2500 Cummins SLT, the 1500 is just as I remember my old 2000 Chevy 1500, but better. The ride is just amazing. I took it on a 3.5 hour run from Central Texas to Rockport on the Gulf Coast this weekend., and then back again. We have a lot of roads with 75 and even 85 mph speed limits, and the truck was just smooth as could be at speed. I was even able to push it up to 100 in some spots - no problem other than the governor. Transmission does seem a bit rough occasionally, but under normal conditions, shifts very smooth. Seats are very comfortable. The room in the cabin is fantastic - really important to me as a 6'4" guy. I get to test towing next week with my 1800 lb boat - don't expect anything unusual. Technology in the cabin is still a little quirky with Android Auto - primarily around the GM voice assistant. Minor criticism though. Very happy with the purchase even if it's only 5 or 600 miles. The dogs love the room in the back with the flat floor. Like others have said - if you know the owner and that the vehicle has been taken care of - get it. You won't regret it. I'm betting my old 2500 rides a lot like your Jeep, and it can be tiring on longer drives. Good Looking Truck! Which levelling kit did you choose? DIY, or did you take it in? Thanks! Mikeb52r - which level kit did you select? DIY or shop? Thanks!